In case anyone was wondering, i made it home. Did it in about twenty minutes less than eleven hours…with three short pit stops. Ummm, make that four because between Winters and Vacaville i pulled off into one of those little numbered farm roads and watered the weeds where there was nobody in sight. The other three stops were for coffee, gas plus Big Mac (not as good as they were fifty years ago), and instead of a burger at Bartel’s Giant Burger at the Corning exit, a chocolate milk shake. First one i’ve had in at least a couple of years, and they’re just as delicious as ever. To celebrate my arrival home, my favorite parking space was sitting there waiting for me. The next afternoon i went to the Castro Farmers’ Market and to my joy Marie at Rodin Farms had her legendary Greengage plums, so i made a jam of them the following morning. 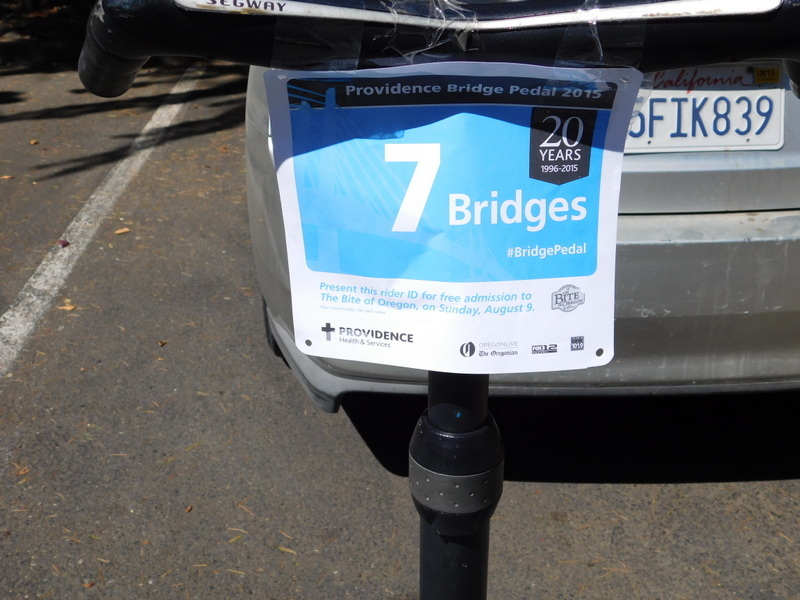 Now i’m working on a full account of my bridge hunting expedition, which will appear in a week or so under the title “2015 Portland Bridge Pedal” in the Bridges menu. Never fear, i’ll trumpet its completion. 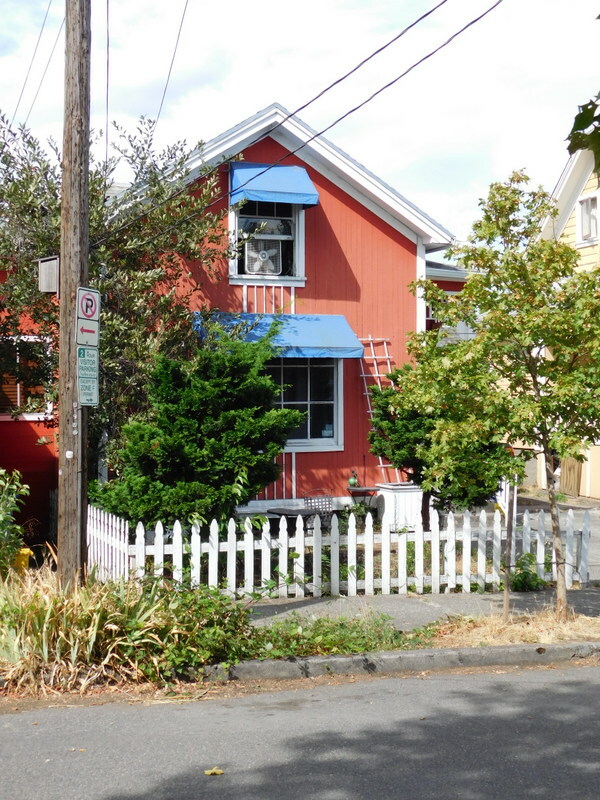 For the promised preview, here’s a little house on a tiny side street off the Neito Parkway. 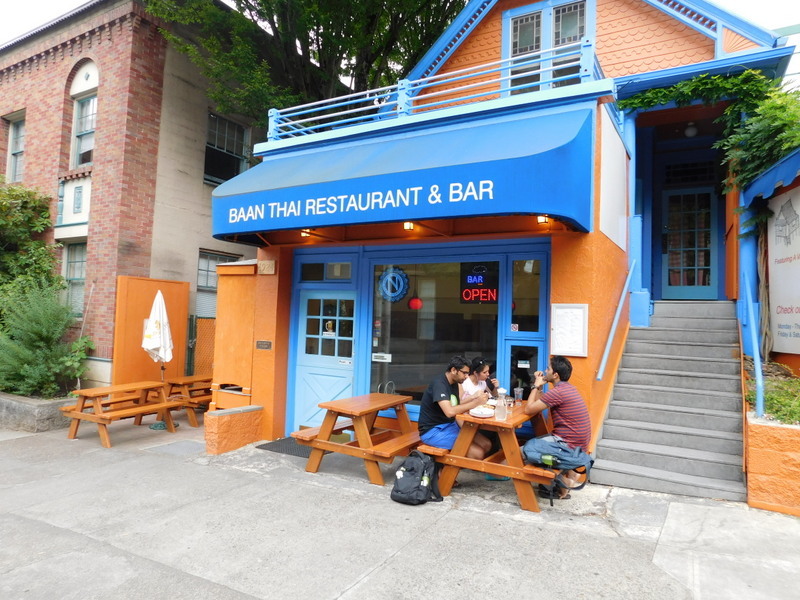 And here’s Baan Thai, where i ate delicious food every night in Portland but one, their being closed on Sundays. If i’d understood sixty years ago that atheists are not forgiven for their sins, i’d have been nicer, sooner. Or just rekindled my faith. Well, i’d almost given up hope, but it finally happened. I encountered a rude Portlander. 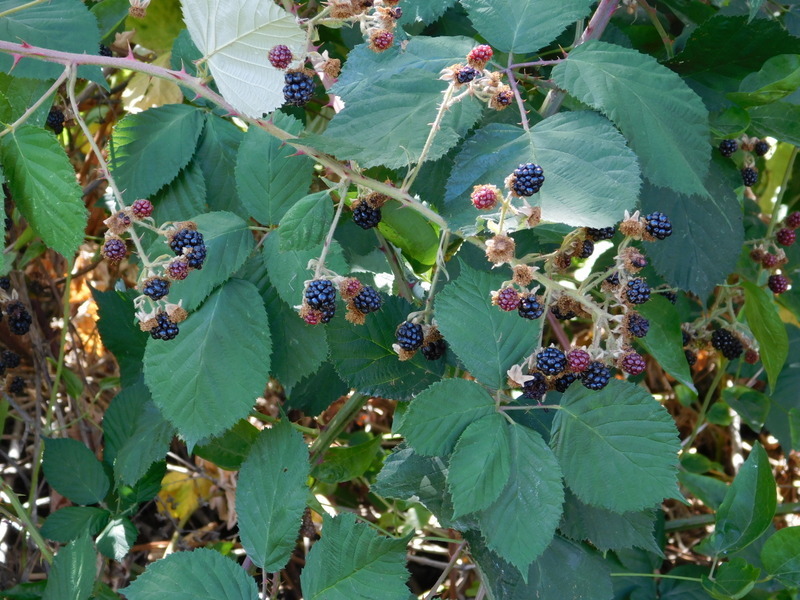 I was out on this morning’s photo foray and was gliding smoothly and cautiously to a halt at a stop sign, still a dozen feet back of it, when a young bicyclist approaching from my right screamed at me to stop. With an obscenity. I laughed loudly at her because that enrages them. The foray continued well. 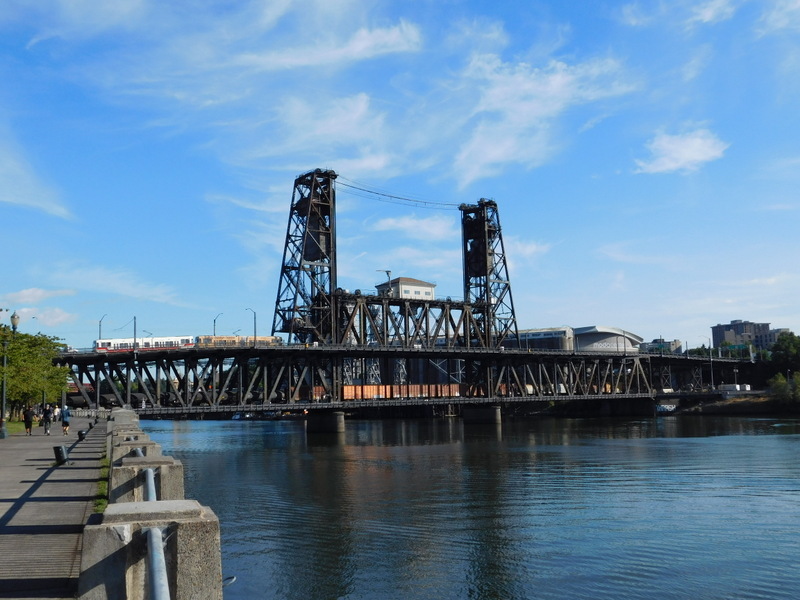 I rode north along the riverside to the Steel Bridge, crossing it today on the upper level with the cars rather than on the lower level with the railroad traffic. Got good shots, including this one that shows a train crossing on the lower level while on the upper level you can see a light rail vehicle, Portland’s handsomer version of San Francisco’s Muni. If you look closely, you can also see trucks on the upper level. For the cars, pedestrians, and bicyclists you’ll just have to use your imagination, but i promise they’re there because i was. And here’s the Fremont Bridge in the background with the Broadway Bridge in front. This afternoon i swung by Baan Thai for an early dinner on Larb Chicken and then headed to the river for my riverboat cruise. On the way, i got busted by a transit authority guy for riding the Segway on the part of the street marked for light rail transit. Told him i was a tourist and wouldn’t do it anymore. Well, see, in San Francisco, you can legally ride in some parts of the track areas, with the forbidden parts marked by clear signage, but since it’s illegal everywhere in Portland, there’s no need for signage. The river cruise was enjoyable, delightfully narrated, and full of photo ops. I snapped 200 of ’em, so i should get three or four good ones. 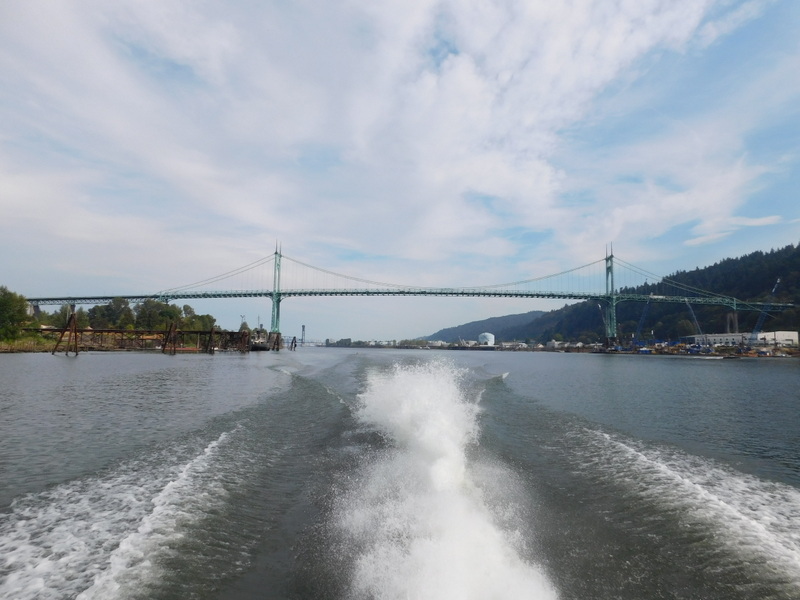 Oh, and the cruise ran from the dock between the Hawthorne and Morrison bridges all the way up to the Columbia River and back, much of it at 40 knots. Never been near that fast in a boat before, and it was thrilling to do so. OK, one photo. 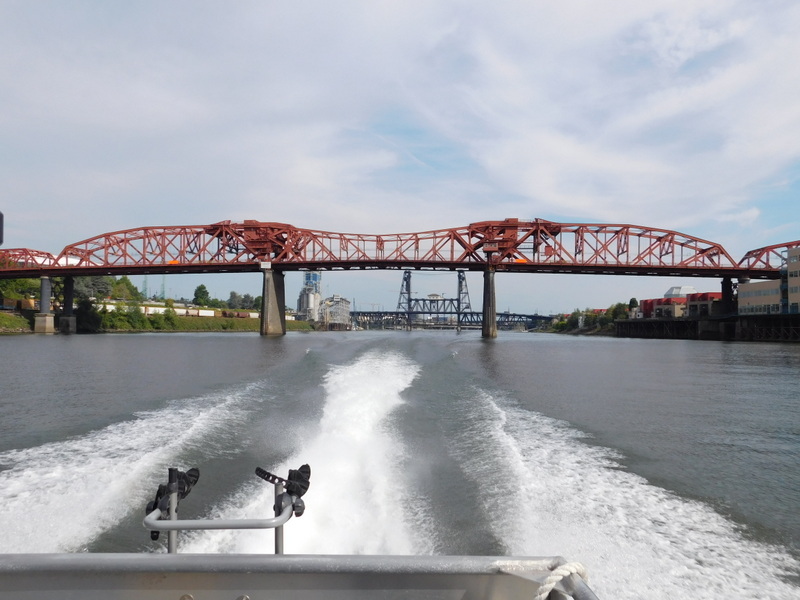 This one of the Broadway Bridge off the stern of the boat. 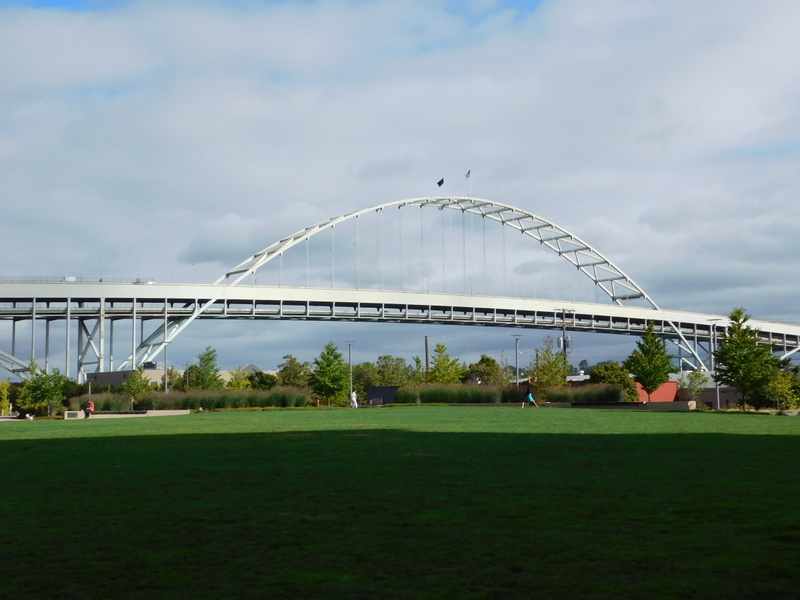 I’m now thinking that that’s the loveliest Portland bridge other than Tillikum Crossing, and besides, the engineering on the double leaf bascules is fascinating. Well, since you already had one of the Broadway Bridge, here’s the St. Johns Bridge. And OK, that’s it for Portland bridges. 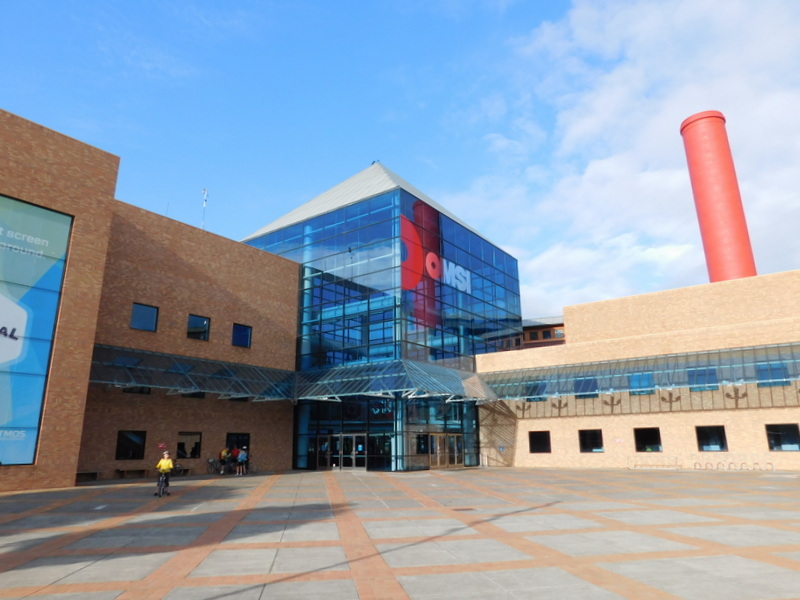 I return home in the morning. Good trip. Oh, everything is falling into place. I started the day by going a Walgreens and picking up an emergency vacation supply of my Gabapentin, which i’d somehow neglected to throw into the bag with all my other meds. The only downside, other than their not being able to clear it through my insurance and thus charging me $25 was that my Segway lock, which had been getting crankier and crankier, finally failed totally. It could have been worse since it failed as i was trying to detach the Segway from an immovable object rather than the opposite. But still, there i was without a lock. Better yet, as i was heading back down to the river to get some morning shots of other bridges i got stopped by a long slow freight train and fell into conversation with a bicyclist nearly as old as i who was headed to the Bridge Pedal point on the east side of the river to pick up his packet and tee shirt. 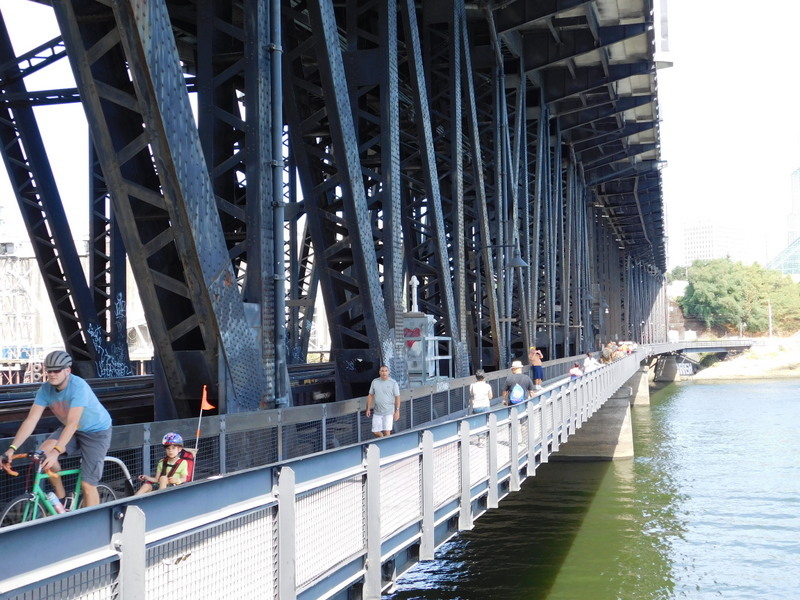 So i joined him across the Steel Bridge, and being in the company of a local, discovered that there’s a bicycle lane across the bridge on the lowest level, a lane i hadn’t even known existed. 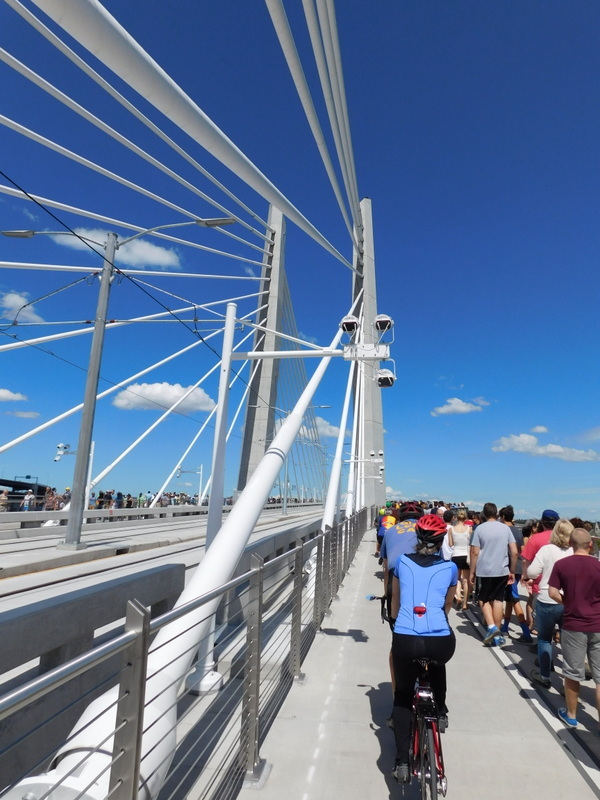 And then we rode along the bicycle path on the east side of the river all the way to the east landing of the Tilikum Crossing, where the packets and tee shirts were being distributed. And where i realized that no, i didn’t have my receipt. So back over the Hawthorne Bridge to the hotel, where i gobbled three Gabapentin and an ibuprofen to stave off the pain from my degenerated cervical disks and slept for two hours. I resumed the adventure by stopping at a bike shop and buying an Arbus bike lock, same $45 price as the comparable Kryptonite but made in Germany rather than China. And then back over the river via the Steel Bridge and the east side bike path to the Bridge Pedal pickup area this time getting a few shots of the bridges along the way. Got in the long line for Will Call and was almost immediately accosted by an expediter who checked my receipt and gave me the entry packet and official entry placard. Not only that, she pointed out that the tee shirts were available Over There without a line, and i got a white large. Flushed with success, i decided that since i hadn’t got good shots of the Sellwood and Ross Island bridges last year, i could bag them from the east side this year. Alas there were signs saying that the Sellwood Bridge was now closed, and since i’d got a fair shot of the Ross Island Bridge i decided i’d just use it for my return. And wouldn’t you know, as i was cutting back inland trying to find the approach i blundered onto the Portland Segway shop, went in, and found they had one remaining Segway lock like my old one. So i bought it since it’s so much more secure than the U-shaped bike lock since all it takes to defeat that is a 5 mm. hex wrench to detach the handlebar assembly. 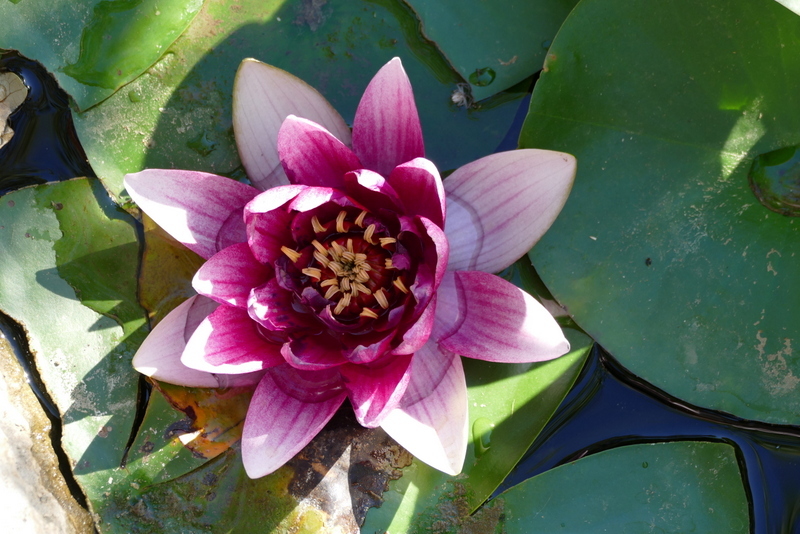 Then came back over to this side of the river via the Ross Island Bridge, snagging a few more pics along the way. Here’s one of the Tilikum Crossing from the Ross Island Bridge. Dinner again at Baan Thai, tonight the Pad Thai and a different draft micro beer. And since i’m on vacation, i grabbed a gin and tonic at the hotel bar to sip while i wrote this. Wheee. Final note: Even though as a retired technical writer i have a Lifetime Exemption from reading user manuals, i’m gonna look into the one for my new Coolpix because i remember that my old one, many years ago, had a feature whereby you could back the Automatic exposure mode off slightly so that your pics were a tiny bit underexposed, which gives a saturation i like better. Well, things are looking up. In the first place, i was wrong, thank goodness, about failing to pack the charging cord for my Segway, as it had just got entangled in other stuff. 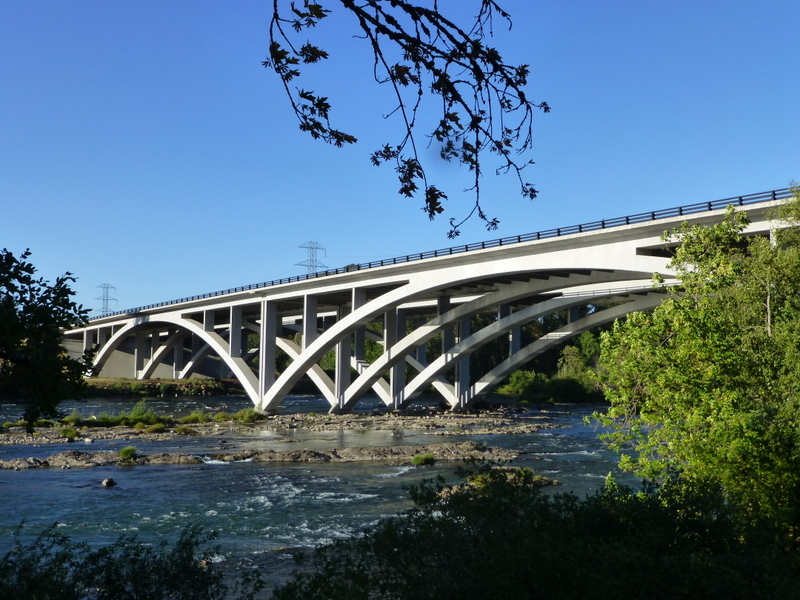 And then i got up this morning and went out on a most enjoyable Segway ride west along the Willamette bike trails in Eugene and got some decent bridge pics. 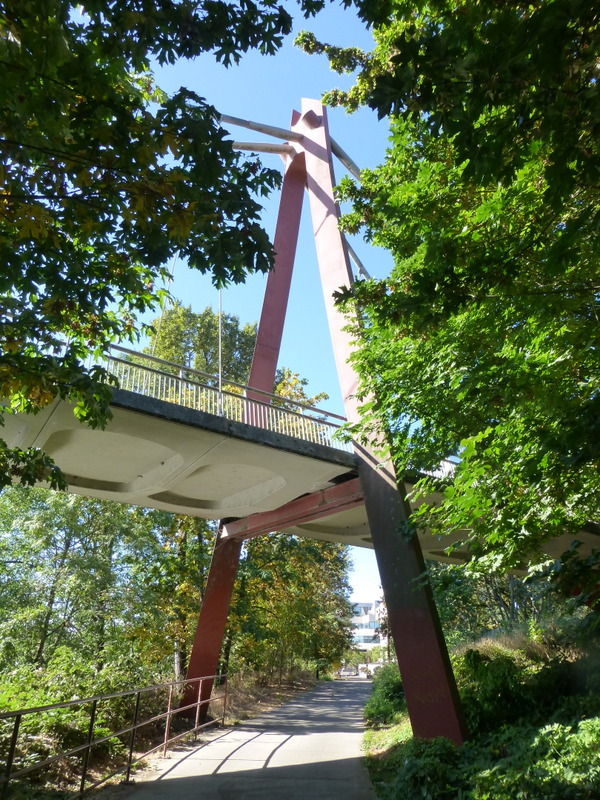 For example, this one of the Peter DeFazio Bicycle Bridge. And then i stopped at Costco on the way out of town and bought a Nikon L840 for only $219, and this being Oregon, there was no tax. This sucker has got 38x zoom, a welcome addition to my camera arsenal. 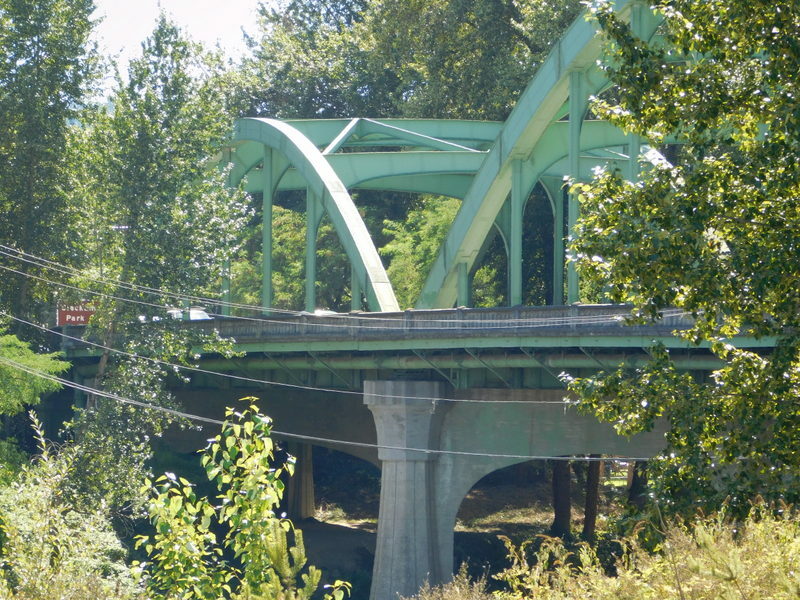 By the time i’d frittered all that time away, i realized that i was going to have to skip most of the mid-Oregon bridges in order to get to Portland in mid afternoon. Thought i’d just catch the two in Wilsonville because i pretty much knew which exit to take to get them. Pretty much. Missed by one exit. Grrrrr, took the next exit and then wasted more time trying to cut back south to find a vantage. 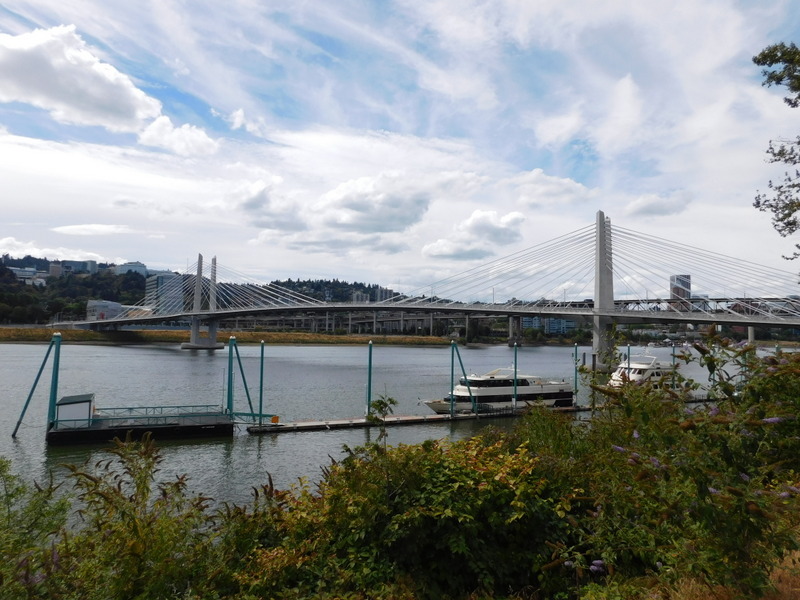 So then gave up and went east to Oregon City, where i had moderate success with a couple of bridges before driving on to Portland to check in to the University Place Hotel. 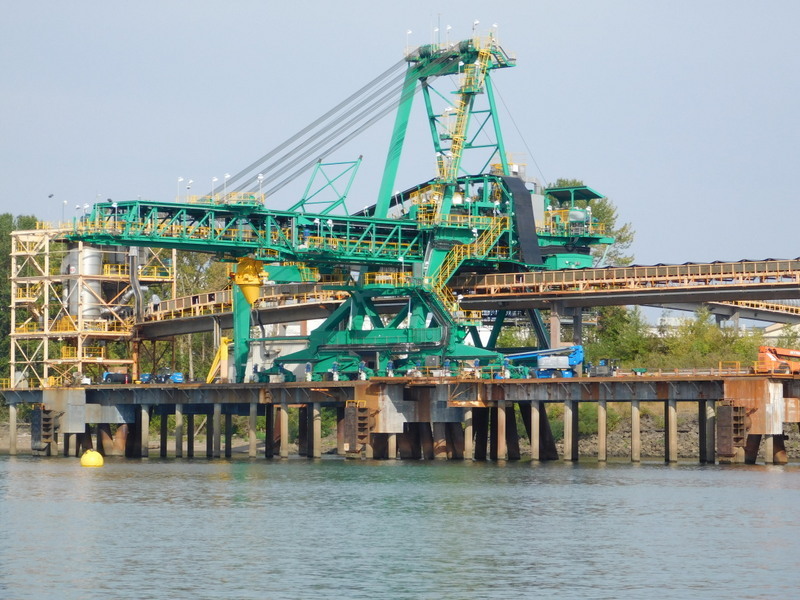 OK, here’s a shot of the Oregon City/West Linn bridge. Oh, and i have a Garmin and find it very useful, but haven’t figured out how to use it to find railroad bridges. What i have discovered is that it can get a bit confused if one is going around in circles trying to find vantages from which to take bridge photos. 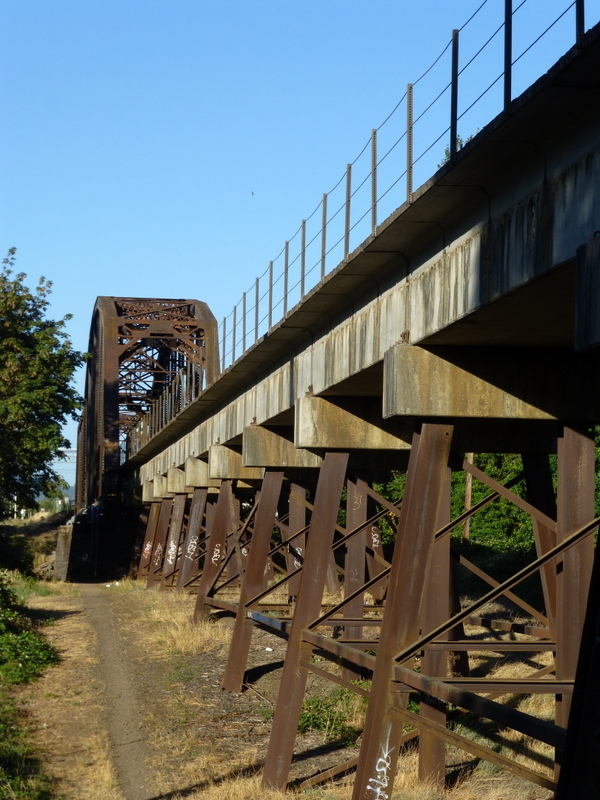 It sent me over that Oregon City bridge twice while it was trying to reorient itself. See, i’d just set it to lead me to the hotel and made one too many side trips trying to get bridge shots. What i clearly need is my friend David to teach me how to use the Garmin. Or better yet, his teenage son who’d of course be able to intuitively exploit all its features. Had an early supper at Baan Thai, a really excellent yellow curry. And so to bed. A fabulous image of San Francisco with the moon in the foreground. I’ve been doing my homework in preparation for the Great Oregon Bridge Adventure. 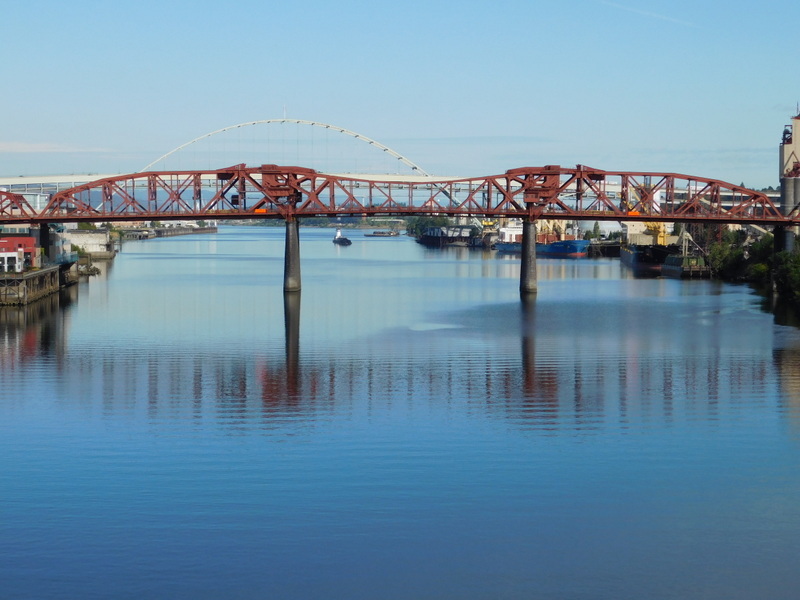 On my first excursion to Portland, last August, i arrived virtually tabula rasa, knowing only that i’d spotted some very interesting looking bridges as i’d raced through at top speed on the Interstate on the way home from an abortive attempt to reach Vancouver a couple of years before. 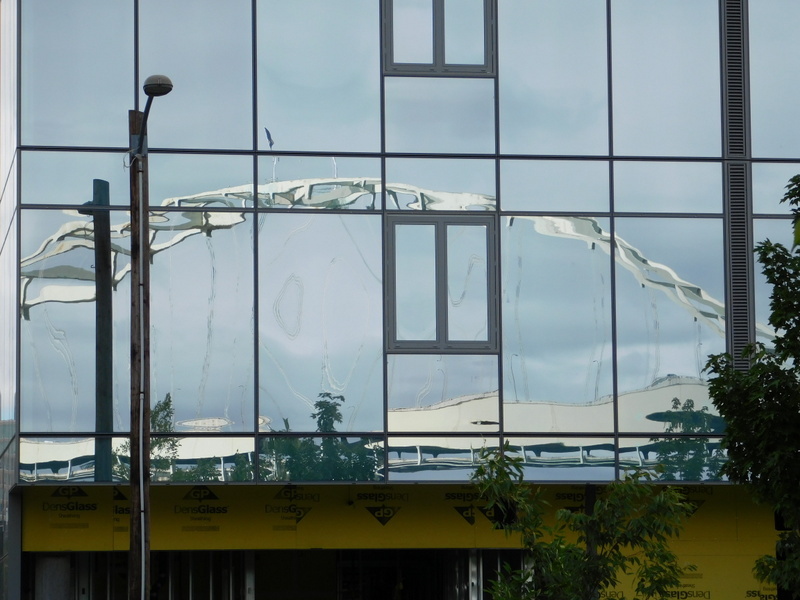 Well, i’d also talked with a former Portlander who’d told me that the city was full of excellent bridges. That was it. In fact, my previous Portland trip followed the pattern of all my road trips. Just get in the car and start driving. Stop when you see something interesting or need to look for someplace to spend the night. 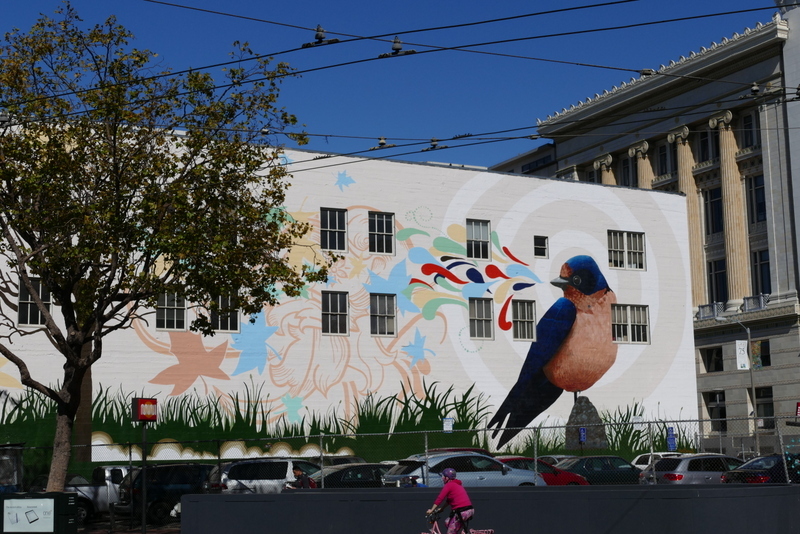 The advantage there being that you get to see things that are not on the usual tourist agenda. It came clear to me after i returned from Portland and was assembling the photo essay on Portland’s Bridges that there was a downside, that if i’d only done some preparatory reading and planning, i could have accomplished a lot more and still have had just as much fun. 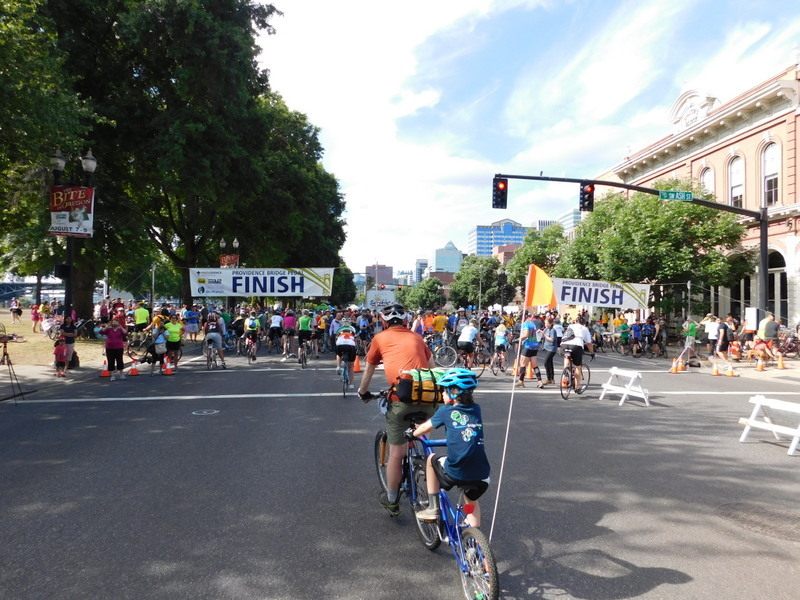 This time, i’ve never made so many reservations in my life: the University Place Hotel, the Seven Bridge ride in the Bridge Pedal, and a Portland Spirit river cruise focusing on the bridges. So i’ll be photographing the bridges from land, as i ride over them, and from the water. Next year, i’ll arrange to be dangled from a drone. 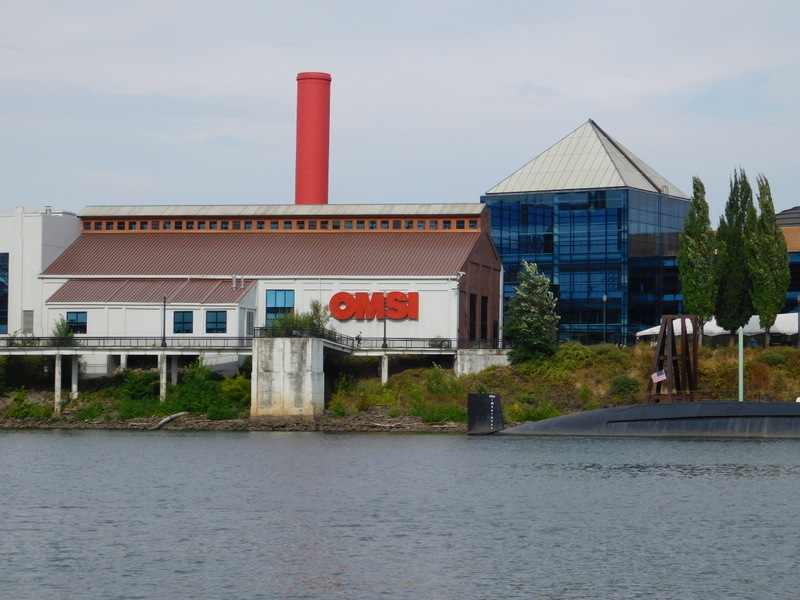 Not only that, but i’ve also done a bit of research and have found a couple places in Portland i want to see if i have extra energy, things that have nothing to do with bridges. And of course i’ll be gorging every night at Baan Thai, the little Thai restaurant on Broadway that’s second only to Basil in San Francisco. So far, i have only one complaint: the least those damn Greenpeacers could have done would have been to wait until i got there for their protest so i could photograph them hanging off the St. Johns Bridge. Stay tuned for posts about my adventures. I start tomorrow morning. It’s 27 years ago this month that Allen died, and of course i still have keepsakes to keep his memory green even though over the years i’ve given most of them to friends and others have simply worn out from daily use. 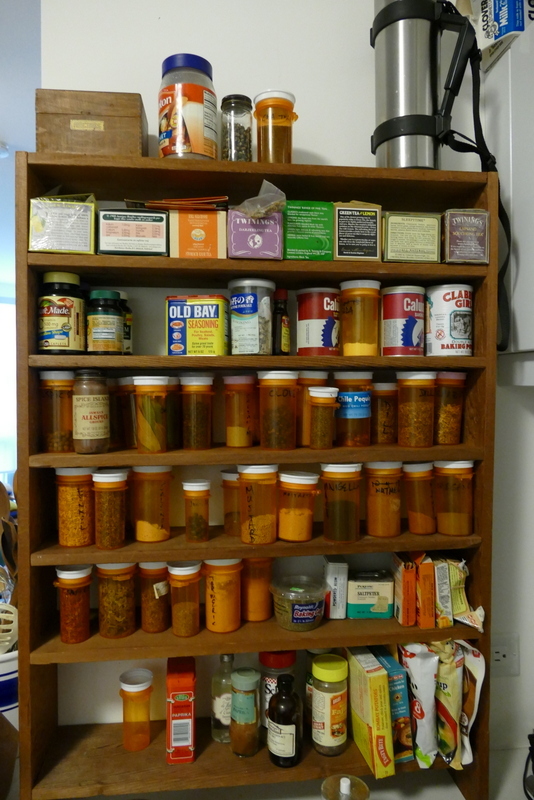 Which means that those remaining are more treasured, so i was upset when, at the end of my move from my former home on Noe Street last November i was in such a state of total exhaustion that i was unable to detach from the wall the spice rack Allen had made for me in 1980. Not that it was a piece of fine cabinetry, since it consisted of walnut stained pine 1×4’s fastened together with finishing nails. But still, it looked good and was eminently practical, so i hated to leave it. But then the other day i got an email from my former landlord Bob saying he’d managed to get the thing off the wall and would like to deliver it to me. After a friendship that goes back to 1974, he knows me well, so he mentioned in the email that he expected my reaction would be that i wanted to pick it up at his place to save him the trouble of delivering it, but that his hidden agenda in wanting to bring it to me was to see my current apartment. So of course i said Yes, and a few days later he came by with it in his arms. The delivery turned out to be a thoroughly enjoyable visit. I made coffee for us and gave him the Grand Tour of my two rooms, and we sat and talked for three hours, catching up on what had been going on in our lives, the repairs and refurbishment he and his partner, Al, had been making on my old flat, and my dissatisfaction with my new apartment and plans to move to Petaluma. He also revealed that getting the spice rack off the wall had damaged it, it being rather flimsy, and that Al had painstakingly restored it and had replaced all those finishing nails with screws, greatly strengthening it while preserving the original appearance. I was overwhelmed with their kindness. And of course the spice rack, back in service although not attached to the wall.